Verse 32 of the first chapter of the Hatha Yoga Pradipika states: ‘Lying upon one’s back on the ground at the full length like a corpse is called Savasana. 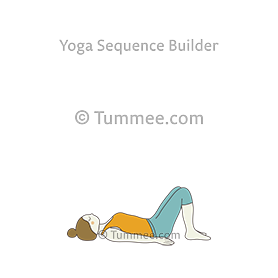 This removes the fatigue caused by the other yoga poses and induces calmness of mind’. ‘Sava’ means a corpse. In this yoga pose, the objective is to imitate a corpse by keeping the body still. By remaining motionless for some time and keeping the mind still while you are fully conscious, you learn to relax. This conscious relaxation invigorates and refreshes both body and mind. This apparently easy posture is one of the most difficult to master, irrespective of the level of yoga practice or the body flexibility. Corpse Pose is considered a base pose as corpse pose variations can be derived from this pose. Corpse Pose helps boost energy in the body and hence can be included in flow yoga sequences. 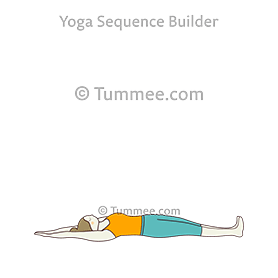 The below cues and yoga sequences added by yoga teachers show multiple ways to do Corpse Pose depending on the focus of your yoga sequence and the ability of your students. Make yourself very comfortable on your mat. You might like a block or a folded blanket under your head. Begin to bring your attention to your body, lying on the mat. Feel the weight of your body. Feel the ground supporting you. Allow yourself to melt downward. 8. Breathe. Draw all of your sensory organs to the breath and follow the breath deep inside. Watch the waves of breath wash through your entire being. Let your entire body ripple with the waves of breath. Be present with yourself. Lie down on your mat with your legs restfully still feet flopping out to the sides, arms with hands palms up beside the body. Allow the shoulders to soften and melt into the floor, tuck the chin in ever so slightly so the back of the neck is long. Close your eyes. Lie down on the mat, taking the feet wider than the hips, palms a little away from the hips. Relax the neck, make any adjustments to get comfortable, allowing the entire body to breathe & relax. Close the eyes & surrender completely to the mat. During this pose, you close your eyes and focus on breathing naturally and eliminating tensions from the entire body. This pose brings about a great deal of benefits to the body if practiced after every yoga session with proper breathing. Some of these benefits are listed below. Savasana firstly brings the breath under control and makes it calm and slow which helps relax the entire body. Savasana calms the nervous system as in this pose the spine comes to rest which is close to the ground. As in this pose the muscles are relaxed (which were expanded with the practice of the other yoga poses) the stress gets released thus helping repair tissues and cells. It is believed to have therapeutic effects for anxiety, insomnia and improved blood pressure. This beautiful yoga pose gives room for connecting with ‘you’ and helps in finding answers to many unanswered questions. It helps to completely learn to surrender and try and connect with the ‘soul’. This yoga pose as a therapeutic yoga promotes and improves respiratory and cardiovascular function, promotes recovery from and treatment of addiction, reduces stress, anxiety, depression, and chronic pain, improves sleep patterns, and echances overall well-being and quality of life. Above are few cases where Savasana may not help when practiced. In such situations it is better to have a personal class with one on one attention with the teacher. 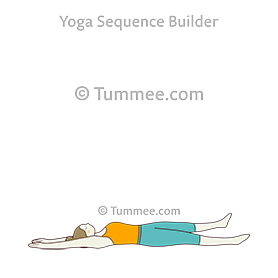 Corpse Pose Variations: Below are some common variations of the yoga pose Corpse Pose with base pose as Corpse Pose (Savasana). 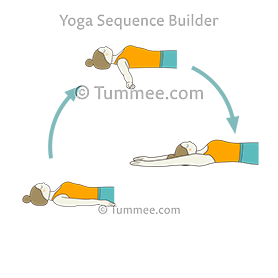 Sign-up to view all 41 variations of Corpse Pose and create your own library of yoga poses to easily and quickly plan your yoga sequences. Begin by first sitting at the centre of the mat in Dandasana stretching the legs out completely bringing the spine straight. Take a few breaths here and place the hands on the thighs and start to calm the breath. Then placing the left hand on the floor turn the hip towards the left side of the mat and slowly bring the side of the back on the mat bending the elbow. Once down turn back again facing up and bring the back completely on the mat making sure the lower back, upper shoulders, back of the head and the calf touch the floor. Spread the legs more than hip distance apart and relax the outer feet on the floor by pointing the toes outwards and heels inwards. Bring the arms on the floor keeping them away from the body and stretched with palms facing upwards. Now close the eyes bringing the chin down a bit and relax the entire body by loosening it completely. Don’t move any part of the body and keep the eyes calm, the tongue relaxed, the jaws relaxed, the teeth relaxed with the mouth closed and the throat cleared. Begin the breathing process and take the mind slowly from the lower body to the upper body. Inhale slowly and begin to take the mind to the tip of the toes, inner soles, ankle joints, calf muscles, back of the knee, hamstring muscles, outer thigh muscles, going down to the knee, knee cap, down to the shin bone, outer ankle joint and back to the toes. Relax now the entire leg with slow exhalation. There should be no movement of the legs now and completely detach your mind away from the leg and begin with the arms. Take the mind now to the tips of the fingers, moving inwards to the palms, wrist joints, inner forearm, inner elbow, upper arm, biceps and triceps muscles, outer elbow, outer forearm, back of the wrist and back to the tips of the fingers. Relax now the entire arm with slow exhalation. Bring the mind now to the back of the neck, moving upwards to the back of the head, crown of the head, forehead, the entire facial muscles, the eye balls, the mouth, the tongue, the teeth, the jaws and the chin. Relax now the entire face and the head and calm the eyes completely without bringing movement to the eyeballs. Taking the mind to the throat, take a few deep breaths here through the nostrils and feel the coolness moving from the mouth down to the throat and the chest and hold this breath for a few seconds and exhale slowly without any noise relaxing the mind and the eyes. Continue this for about 6 breaths and feel the soothing energy within you as inhale and exhale. Take your mind to the chest, the ribs, the entire abdomen, going down to the pelvic and to the inner thighs. Relax the entire upper body now with slow exhalation. Now move to the sides of the upper legs, the hip joint, moving inwards to the lower back, then slowly upwards to the middle back, the shoulder blades, in between the shoulder blades, the upper back at the shoulders and finally the place where the shoulder and neck meet. Relax the entire body now completely and stay detached from the body. Move all the energy to the tip of the nostril and watch the inflow and outflow of this energy and with the awareness the body will slowly begin to relax. Now the entire body is put to comfort and watch the mind now. If the mind wanders give it a few breaths and pause for a few breaths and exhale slowly. Never mind if you sleep :-), this will be overcome with practice. Stay here till the entire body feels relaxed first and then taking the focus to the mind and the thoughts bring it under control with slow exhalation. To tame ‘Prana’ depends upon the nerves. Steady, smooth, fine and deep breathing without any jerky movements of the body soothes the nerves and calms the mind. The stresses of modern civilisation are a strain on the nerves for which Savasana is the best antidote. Please sign-up to view preparatory poses for Corpse Pose. 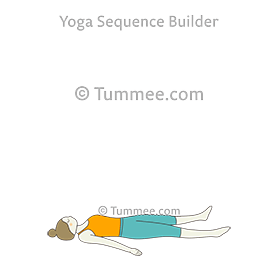 We have 10000+ reference sequences along with foundational yoga sequences built from a library of 1750+ yoga poses (with new yoga poses added daily). Please sign-up to view relaxing follow-up poses for Corpse Pose. 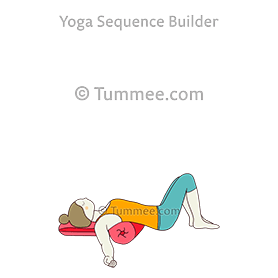 We have 10000+ reference sequences along with foundational yoga sequences built from a library of 1750+ yoga poses (with new yoga poses added daily). To gain better results from Savasana, repeated practice is essential. Mastery over this asana comes with awareness of the body and the mind and connecting it with the universe around you. If one wants to take Savasana to the next level after reaching a comfort level with this practice, one could practice it with the chanting of the Gayatri Mantra initially for 21 counts and then slowly increase the chants to 51 and finally to 108 chants. This powerful technique will help in completely relaxing the body and staying aware of the breathing and using the energy to heal the entire body. Savasana can bring miracles to the body if practiced with an open mind and the mind to surrender. The chanting of the Gayatri Mantra will bring glow to the body. But make sure this practice is done in a room free of any direct sunlight and the environment is quiet with no fan or air conditioner. Scientific articles that were referenced to describe benefits and contraindications for Corpse Pose. Please find them below.